Congratulations to you and your accomplished daughters! It was been great to follow along and see all of your adventures. I want to keep hearing your voice too, so I am glad you are going to keep this blog going as well as the other exciting things your family is involved with. Thanks, Marcy! I love your blog and draw inspiration from it. Hey! Just read your book & I wanted to say that it really reasonated with me. We spent the first 17 years of our marriage in Colorado so my kids spent HOURS hiking mountains with me They all went out in backpacks before they could even really sit up As soon as they could walk my husband and I let "hike" for a bit. 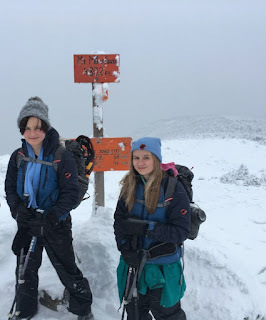 I never told them any hike was "too hard for kids" either, & our homeschooling (at that point) allowed for so many adventures! Unfortunately 3 years ago we moved to the flat land of Florida I miss the mountains being so close and being able to go appreciate them with my kids now ages 17,12& 11. Anyway, I don't even know if you check this blog much, but I just wanted you to know how much I enjoyed & related to your story. Hi Kim, thank you so much for your comment! I love Colorado and need to spend more time out there. Hopefully you and your kids get to visit sometime.